Door frame is constructed by extruded Aluminum. Frosted tempered glasses in-fill give the door its unique modern look. The door panel is guided by tracks and balanced by a spring system. Electrically operated garage door opener opens or closes the garage door quietly and locks it completely when closed. Other advanced features such as auto-reverse upon obstruction and auto-light further enhance safety and convenience. As part of the door panel stays out when fully opened, canopy door needs less space to install, ideal for garage with ceiling obstruction. 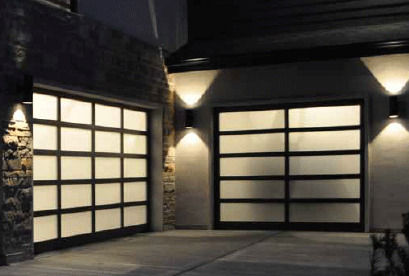 Semi-transparent frosted tempered glasses provide light for the garage during the day. At night, it becomes a light source for the yard outside with garage lights turned on. 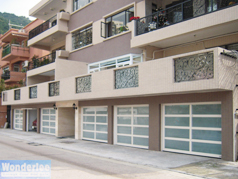 Aluminum and glass will never rust, prefect for the humid weather in Hong Kong.